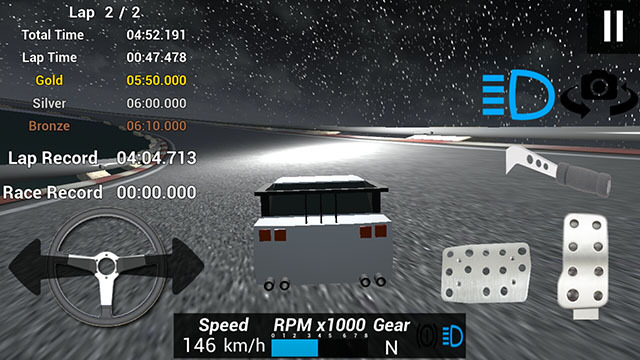 Put your seatbelt on, release the handbrake and floor the gas pedal for this great racing game! Today we’ll review a racing game. Is there anyone who hasn’t played a racing game yet? I believe everyone took a controller in the hand at least once, whether it was for Need for Speed, F-Zero, Gran Turismo or Mario Kart. While I am extremely bad at the latter, I was a fiend at Top Gear! Now, let’s check out this mobile racing game! Romantic getaway under the stars. The game is awaiting you with currently nine different race tracks in three modes: Easy, Medium and Hard. In each, you’ll try to beat the time records and gain gold, silver and bronze medals. 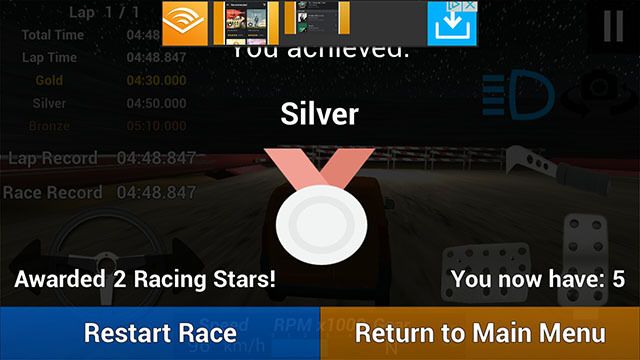 For each win, you’ll get Racing Stars, which you’ll need to unlock more cars. When you first start the game, you can choose your graphics settings or let the app autodetect what’s best for you. It recommended me to play with a lower frame rate, but I still went with a higher one. So just try out what fits you best. Furthermore, you can choose between touch, sensor, gamepad or keyboard controls. Amazing options! 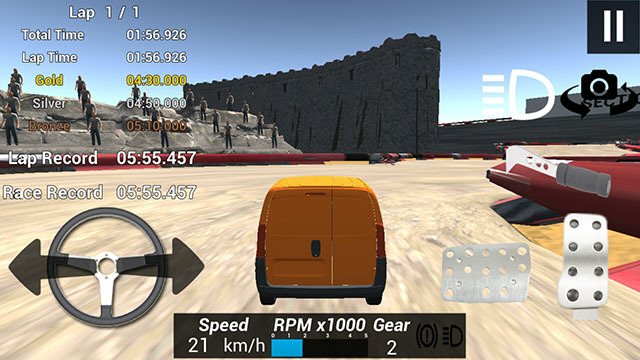 The game offers a fun gameplay with several race tracks and fitting music and sound. You’ll even get your own audience cheering for you! Despite the word Trial in its name, Fast Drive Time Trial is a well-rounded game with only small things, that need to be addressed. Firstly, it would be great to deepen the graphical environment of the game. While the surroundings are already quite nice, more details like 3D figures, plants, and more refined looking cars, would make it even better. Another minor improvement could be made on the ad placement. While it doesn’t disturb the gameplay, it is hard to see all information (see an example below). Maybe you could turn it off during the menu? The last point concerns the touch controls. They are sometimes too sensitive: If you press the arrow a tenth of a second too long, you might end up turning your car to the back. It doesn’t happen too often though. Slowing down to acknowledge the audience. “Fast Drive Time Trial” is a great racing game with several levels of difficulty, interesting race tracks, and multiple cars. It is available on Google Play.